I'm glad to be back sharing my S.O.A.P.s with you as we read through the Bible. We are still in Genesis and I'd love to hear your thoughts on these chapters from our reading this week. Observations: Rachel and Leah let their jealousy of each other lead them into actions that put themselves in the place of God. They’re both going to get what they want and they do whatever it takes to get it. They look to their maidservants and mandrakes (thought to promote fertility and conception in barren women), rather than patiently waiting on God to give them children (and in doing so would be fulfilling His promise to Abraham). Application: Jealousy can cause people to do awful things. Impatience can cause us to take matters into our own hands rather than waiting on God to move in the situation. We often think He has forgotten us because He delays in answering our prayers or even worse – says “no, not now”. We are driven by what we want or how we think things should be and forget that God knows what’s best and that He does love us whether He says “yes” or “no”. Prayer: Heavenly Father, help me to remember how much You love me even if my prayers go unanswered. May I always look to You for my needs as well as my desires and to trust that You know what is best. Help me to remember that Your love for me is not based on how many of my prayers You answer, but to know that Your love for me was settled so long ago when You gave Your only Son so that I could have everlasting life with You. It’s in His life-saving name I pray. Amen! Observations: Jacob didn’t remove himself from the situation until told by God to go back to the land of his father and relatives. He was assured by God Himself that He would be with him. Jacob was with Laban for a total of 20 years. Near the end of that time, Laban’s sons began speaking unfavorably against Jacob and even Laban’s countenance towards Jacob changed. Jacob had served long and hard during those 20 years. He was deceived many times by Laban. But through it all, he remained loyal to Laban until God finally told him it was time to go. God assured Jacob that He would be with him as he returned back to the land of his father and of his relatives. That wasn’t a great situation to be going back into either considering how Jacob had deceived his father and his brother. I think this shows too how God will take us back into situations that we have failed to resolve and learn from. His presence with us during those situations can give us the courage we need to face it confidently and to handle it according to His truth at work within us. Application: It’s so easy during times of fear or difficulty to simply flee from the situation. Rather than deal with the emotions or conflict, we avoid them altogether by running away. It’s during these difficult times that God can mold our character for His glory. Unless it is a life-threatening situation, we must learn to stay in those difficult situations and allow God to refine us. Don’t remove ourselves from the situation unless or until God tells us to. Otherwise, He may very well bring us back to the situation at a later time in our life and require us to settle it finally in a way that will be honoring to Him. Prayer: Heavenly Father, I thank You that You are with me in the moments of my life that are fearful and difficult. Help me to remember this when my emotions are running high and I feel the tendency to flee from the situation instead of dealing with it and learning from it. Help me to see how You can use these times to mold my character for Your honor and glory. Teach me Your truth in these situations so that I may in turn help others who find themselves in a similar situation. Help me to faithfully remain until You decide it’s time for me to move on in a peaceful way. I pray and ask this all in the wonderful name of Jesus. Amen! Observations: This is one of my most favorite chapters of the Bible! Jacob is afraid for his life and the lives of his family when he is told Esau is coming with 400 men to meet him. He’s not sure what is about to happen, he is afraid, and we see him for the first time going to God in prayer. We see a transformation taking place by the words spoken in his prayer – one of humbleness and submission. He’s at a moment of crisis in his life and takes his fears and concerns to God. Jacob prays back to God the promises He has spoken to Jacob in the past. 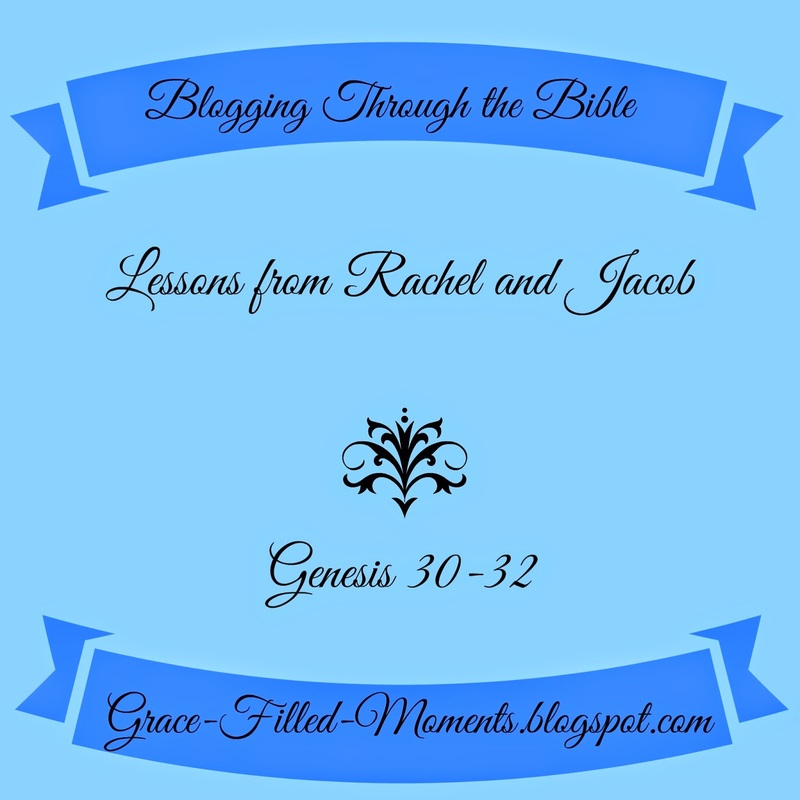 Next we see in Genesis 32:24-30 Jacob wrestling with God. He’s wrestling for his own blessing from God – one that has not been deceitfully taken. Jacob knew “about” God, but he didn’t “know” God. He knew the God of Abraham and the God of Isaac. He’s reached a point in his life where he longs to know God in a personal way. Application: I love praying God’s Word back to Him! I take comfort in knowing that God will be faithful to His Word. In times of fear and uncertainty, may we always run to God in prayer. There comes a time in all of our lives where we have to experience God in a personal way. We know about Him through the Scriptures we read, but there will come times of crisis in our lives where we will get to experience and know Him as we watch Him move in our circumstances. There are good times as well where we experience the goodness of God that carry us through the dark times of our lives. God desires an intimate and personal relationship with each one of us. Prayer: Heavenly Father, thank You for loving me and for desiring an intimate and personal relationship with me. I thank You for the promises of Your Word that are mine as Your daughter. Help me to hide Your Word in my heart that I might not sin against You and so that I can pray it back to You. You have promised that Your Word will not return void. Help me to stand on that promise as I seek Your face and Your will through prayer. Thank You for the good times and the hard times of life that are all opportunities to experience You in a deep and personal way. Help me to remember this during the hard times. I pray and ask this all in the precious name of Jesus. Amen! **It's your turn! I'd love to hear what you learned from these chapters. Please share in the comments below.